As you might expect for a colt who sold for $1.2 million as a yearling, Tapwrit has always been the type to catch the eye. His good looks match his pedigree. The gray gets his coat color from leading sire Tapit, and his dam, Appealing Zophie, won Saratoga’s premier race for two-year-old fillies, the Spinaway (G1), in 2006. At the end of her three-year-old campaign, Appealing Zophie was purchased at Fasig-Tipton Kentucky November for $1.1 million by My Meadowview. That’s the nom de course of Leonard Riggio, the chairman of Barnes and Noble. 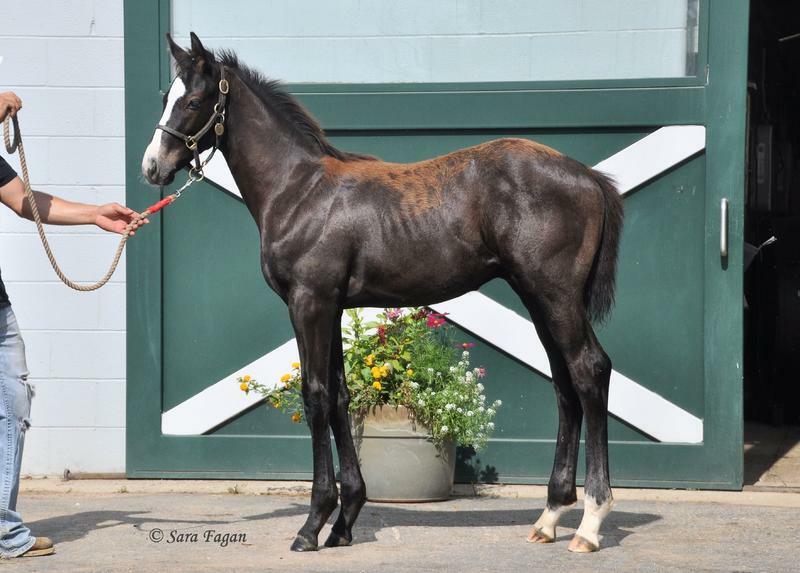 Bred by My Meadowview, Tapwrit was raised at Craig and Holly Bandoroff’s Denali Stud near Paris, Kentucky – also the birthplace and childhood home of 2011 Kentucky Derby champion Animal Kingdom. “This kid was always one of my favorites,” said Bush, who had charge of the colt from babyhood until he completed the weaning process. And his demeanor? A “pretty straightforward” individual all around. In fact, the youngster was such an attractive prospect that Bush wondered if My Meadowview might want to keep him, instead of sending him to the sales. After weaning, the yet-unnamed colt was moved over to Snellings’ division, where his paddock mates included two other future graded winners – turf performers Ticonderoga and Made You Look. The three engaged in the typically high-spirited play of colts in the field, but they were all good babies. “One thing about good horses, you don’t have problems out of them,” Snellings said. “They do everything that you ask of them, don’t cause trouble. Tapwrit left the carefree life of the field about six weeks earlier than Ticonderoga and Made You Look because he had to begin his yearling sales prep sooner. While they were slated to sell at Keeneland September, Tapwrit was cataloged for Fasig-Tipton Saratoga in August. “Always one of my favorites,” was how Snellings characterized Tapwrit. “Always a big, forward, athletic-looking colt…We didn’t have to do much with him. That’s a good thing; a youngster who does unexpected or unusual things can turn out to be too problematic to progress in training or on the racetrack. The sales yearlings have to undergo all sorts of inspections from potential buyers, and handle the hustle and bustle of the sales grounds, before entering the auction ring. Between his physique and his pedigree, Tapwrit was in high demand, so he was often being led out for inspection. But again, the good ones cope with it just fine. The colt checked all the boxes, so to speak, as a top-notch yearling at the prestigious sale. He accordingly figured to go for a budget-busting seven figures. A trio of interested parties – Bridlewood Farm, Eclipse Thoroughbred Partners, and Robert LaPenta – thereby decided to team up to acquire the colt. The plan worked as they saw off rival bidder Al Shaqab Racing and secured him for $1.2 million. “It was a natural partnership,” Bridlewood’s George Isaacs told Thoroughbred Daily News at the time, since both Eclipse and LaPenta were already sending their youngsters to receive pre-training at Bridlewood. That early education comes under the direction of Jonathan Thomas, a horseman virtually from birth at Paul Mellon’s historic Rokeby Farm. His budding career as a jockey was halted by serious injury, and although he made it back to the saddle, it was on an amateur basis. His professional pursuits turned instead to training. Aside from a stint as trainer for the late King Abdullah in Saudi Arabia, Thomas was also an assistant to Christophe Clement, Dale Romans, and Tapwrit’s trainer, Todd Pletcher. Tapwrit arrived at Bridlewood, near Ocala, Florida, with big expectations. The gray did just that, getting “incrementally better” throughout his time at Bridlewood. “There was a moment of excitement – one work in particular at the farm where he put everything together. Shortly after officially getting his name, Tapwrit joined Pletcher at Saratoga last summer, and on September 3, he was ready to make his debut in a seven-furlong maiden. His 5-1 odds implied that he’d probably need this first race to bring him on. Even so, few could have forecast that Tapwrit would tire to last of 10 after chasing a torrid pace out wide. From making a splash as a pricey purchase at Saratoga the year before, he now flopped at the “Spa” in an inauspicious start to his career. Snellings, back home at Denali, remembered the letdown well. Snellings noted that “maybe it just took a while” for Tapwrit to come into his own. That’s how Thomas sees it as well, chalking that first race up as educational. Thomas also praised Tapwrit’s team of owners – “such a cool group of guys” – for how they dealt with their big investment’s trailing home on debut. “The partnership group with Robert LaPenta, Eclipse, and Bridlewood – they have been excellent owners,” he said. Tapwrit has gone from strength to strength since. Thomas finds his progression reminiscent of his former pupil Destin, one of the notable sophomores of 2016 who just missed in the Belmont (G1). The parallel goes beyond the fact that Destin and Tapwrit are both Pletcher trainees and Tampa Bay Derby (G2) winners. “He reminds me a lot of Destin, a horse who’s incrementally gotten better. The horse has always been athletically gifted; he just needed time to grow up mentally. While not making a direct comparison, Snellings mentioned that Tapwrit has something broadly in common with Animal Kingdom. In 2011, racing media kept asking Snellings if anything had ever stood out about the Derby winner. “Absolutely nothing. The real good ones stay out of trouble, go along with the program. Tapwrit fans will hope that the “same kind of deal” extends to wearing the roses.